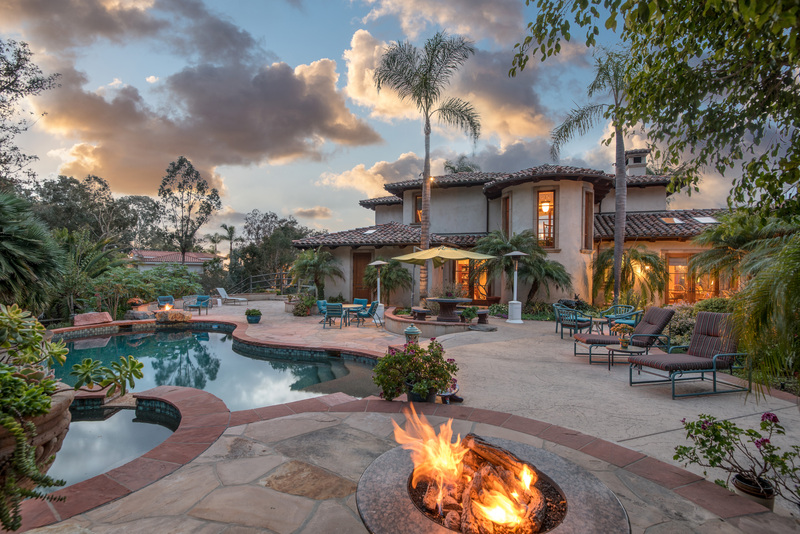 Spectacularly designed Rancho Santa Fe Covenant home. Set at the top of a long private driveway, this home offers scenic panoramas, brilliant architectural details, and an easy flowing floor plan with multiple doors opening up to four meticulously landscaped acres with putting green, fenced backyard with a pool, spa, and room for horses. A first floor master allows for single level living while a second master retreat upstairs includes an ocean view balcony, fireplace, library or exercise room, and luxurious bathroom with jetted soaking tub. Some of the masterful designs in this amazing Rancho Santa Fe Covenant home include a variety of ceiling styles including groined and barreled, coffered and boxed, and a cathedral wood ceiling with open beams, plus ornamental archways, stained glass doors, and Brazilian cherry floors. The four acres includes a golf putting green with hitting mat and sand trap and meandering paths interspersed with stately palms and gardens of drought tolerant plants and citrus trees. Gourmet inspired, the kitchen has a center island, decorative etched wood cabinets, butler’s pantry, wine cellar, and breakfast room with French doors opening to the secluded, fully fenced backyard with pool, spa, water feature, and 2 fire pits. The attached one car garage has a work station and opens out to the backyard. A lovely colonnade leads to a separate 2 car garage with storage. Other features include central vacuum, whole house water filter, indoor and outdoor sound system, and covered patio with fireplace. Listed by Cathy Gilchrist Colmar.